It’s been another tough week as a Bannsider. Probably tougher as those games at home are the ones in which we should be taking all three points. Credit to Newry for Friday night past. They deserved what they got out of the game, and deservedly we got nothing. We were bitterly disappointed as a group of players and as a staff that we let ourselves down. The ability we have in our changing room, we should be blowing teams away at home, like we have been over the last eighteen months. There have been injuries and suspensions over the last number of weeks which have taken their toll on our squad. There have been players playing through niggles and there have been players playing injured. They are not excuses for our recent performances and results as we have enough ability to be winning those games, but something we have had to manage as a group. 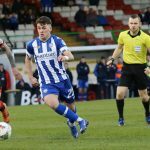 There are players who are pushing themselves to be fit for selection and trying to show how much they want to play for Coleraine and how much it means to them and us as a group. For me it’s important now that going forward, we stick together as a club, from top to bottom. Everyone at the club needs to be together. The board, the staff, players and fans. This isn’t the time for panicking or pointing fingers. This is the time to show the rest of the league and everyone outside our club who want us to fail, who want to see us lose, that we’re united. That we stick together and will work hard together to get back to winning ways and push back up the league. Believe me, it’s frustrating for us as a group. We haven’t kicked on from the Linfield game as we should have but we must deal with that and aim to push forward and get going again by beating Ards this Saturday. Believe me when I say that people outside our club don’t want us to do well. Other clubs and other people are asking questions and pointing the finger at us. Let’s show them that we’re together. Let’s show them that everything we have built over the last 18 months doesn’t go away overnight. Let’s get back to the realisation that it’s us against everyone else. Staff, players, fans, board. It’s our club against the rest. It’s time to kick on together and show everyone what we’re all about. Positive results make that easier, I understand that, but it’s a real test of our character as a club how we go about getting through this sticky patch. 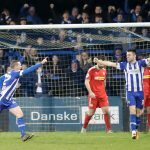 For me, the Coleraine that I know and love sticks together, stands up, sings loud and proud and players give everything they have for three points on a Saturday. This is the time to show the rest of the league and everyone outside our club who want us to fail, who want to see us lose, that we’re united. Throughout a difficult week there has been positive news that I’m sure you will all be aware of. Lyndon Kane has made huge strides recently with the hard work he has been doing with Alan Millar, and managed to come through a friendly on Tuesday night against Portstewart. This is brilliant news for him and all the boys are delighted to see him back. It’s tough when an injury reoccurs and keeps you out as long as it has kept Lyndon out. 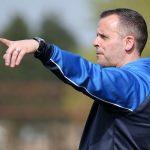 It was unjustifiably cruel that he had to miss the Irish Cup Final as Coleraine means so much to him. I know he will come back hungrier than ever and it will be sooner rather than later that we see him back out there at three o’clock on a Saturday. The biggest compliment that I can pay Lyndon about this week is that in his first game back, he looked like he had never been away. He played last year away to Glentoran after one reserve game and he was outstanding that day. Hopefully he can come back and hit the ground running again. Some more good news is that James McLaughlin is getting closer to a return. As is Parky. Another two players who can influence games and are big players for us. Hopefully the two boys will be back fit and fighting before long. Finally, this week’s game against Ards is a chance for us all to show how much we want to do well together. To show how much our club means to us as fans and as a group of players. Ards will come and sit in and try to get numbers behind the ball. We must remain patient and find ways to break them down. If it comes in the ninth minute or the 90th minute, we must remain patient and keep pushing to make sure that come five o clock, we have all three points. You will be important in that as your positivity gives us as players the confidence to keep getting on the ball and keep being positive with our decision making. Whether that’s making the right pass or taking players on and creating chances. So hopefully we can get a big crowd back out to The Showgrounds and we can put on a performance that will be full of energy and hard work. Saturday is a chance for us all to get three big points and show everyone what we’re made of. I look forward to seeing you all on Saturday.